General Hospital (GH) spoilers for Friday, May 11, tease that Sonny (Maurice Benard) will mull over the latest Croton developments. Many years ago, he buried a body and the incriminating weapon in a field. Now construction’s getting underway in the same area and that can only spell trouble. When Jason (Steve Burton) arrives, Sonny will deliver the terrible news. He’ll realize things are going to get rough if someone starts digging around. Sonny’s life could be torn apart, so Jason will do everything he can to prevent that. He’ll vow to have Sonny’s back, which means they’ll be heading to Croton with some shovels next week. 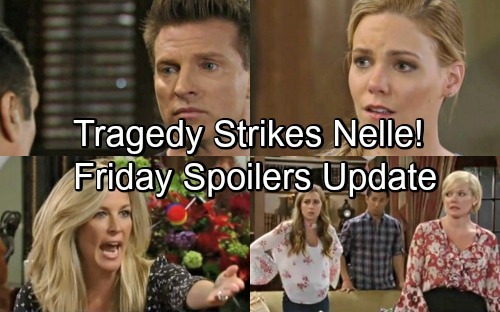 Other General Hospital spoilers say Carly (Laura Wright) will finish chewing out Ava (Maura West) and turn her attention to Nelle (Chloe Lanier). She might assume the penguin mobile was a collaborative effort. Regardless, Carly doesn’t appreciate this slap in the face. Those penguins reminded her of Morgan (Bryan Craig), so her grief and anger will explode in this moment. Josslyn (Eden McCoy) will beg her mom to calm down, but Carly will just keep ranting. She’ll feel like Bobbie’s (Jacklyn Zeman) the only one on her side. GH fans can expect Nelle and Carly to wind up at the top of the stairs. As you might expect, Nelle will fall down a flight and accuse Carly of pushing her. It won’t be true, but that won’t stop Nelle from claiming it! While Nelle and her baby face grave danger, Valentin (James Patrick Stuart) will track down Anna (Finola Hughes). He’ll note that she’s been avoiding him and he’d like to know why. Anna may suggest that there’s nothing to talk about. She’s concentrating on Heinrik, so she doesn’t need Valentin getting in her way. Anna might suggest that anything he has to say can wait until her mission’s over. Over with Nina (Michelle Stafford), she’ll be surprised by some info Curtis (Donnell Turner) hands over. Nina will ask if this is what she thinks it is, but what will they be talking about? Although Nina pushed Curtis to end the investigation, he probably found something juicy anyway. Whatever Curtis scored will leave Nina thankful and determined. This could put her on the path to the truth about Peter (Wes Ramsey). Speaking of sneaky Pete, he’ll have another discussion with Sam (Kelly Monaco). General Hospital spoilers say Peter will wonder if Sam’s reconsidered. He’s probably hoping she’ll back out of her decision to remain at Aurora. That would relieve some pressure for Peter, but it seems he’ll be out of luck. Sam can’t bail until she learns more info about the company’s shady COO! Will Sam eventually be the one to learn the dirty details? We’ll give you updates as other GH news comes in. Stay tuned to the ABC soap and don’t forget to check CDL often for the latest General Hospital spoilers, updates and news.